This entry was posted in General, Tablescape Thursdays and tagged candy corn, centerpiece, fall. Sorry for the delay! We don’t often check our messages 🙂 There is a vase inside the hurrican vase- to keep the marshmellow and candycorn in and the flowers together. Then the stems are cut to the appropriate height. Are there directions for making the candy corn vase? 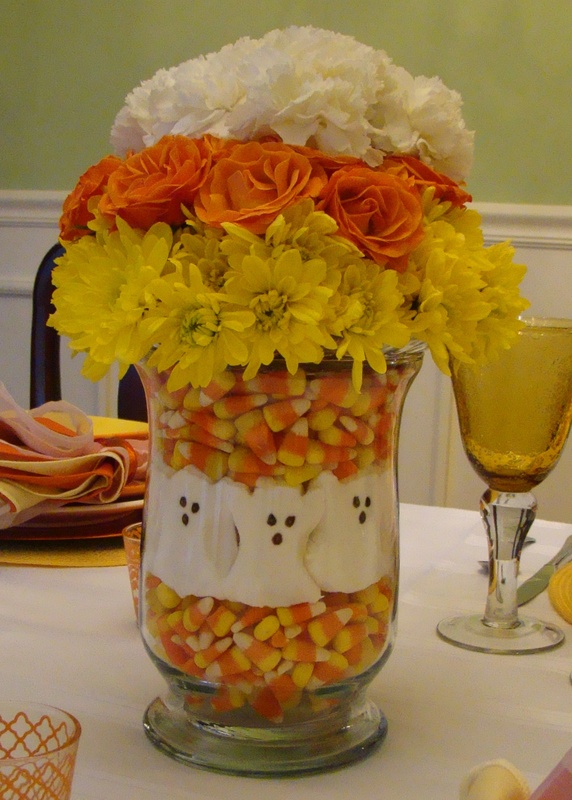 How do you get the peeps to stay in place while you fill the vase with the candy corn etc. Hi Diane! There is a skinnier vase within the vase that helps keep it all in place and takes up space so you don’t need as many candy corns. If you look closely the flowers are on a block of foam that is taped to a glass plate sitting on top.